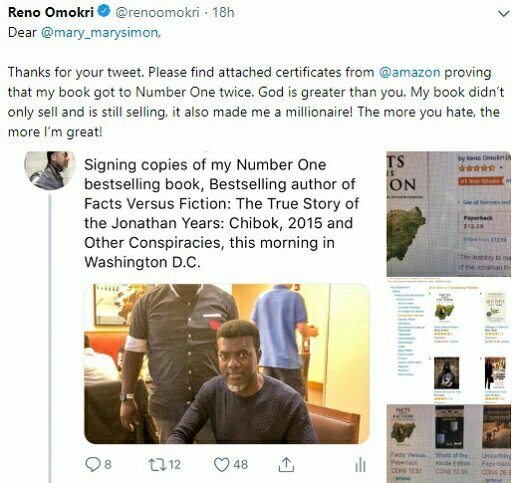 Reno Omokri, we love to call him, ‘Reno with the words’, lol has replied one of his critics, who thinks his words are fallacies and condemned his books as well. Reno took out time to tweet back at her with photos saying his book did got to No 1 twice on amazon and he has certificates. He was also fast to tell her the book also made him a millionaire. Dear @mary_marysimon, Thanks for your tweet. Please find attached certificates from @amazon proving that my book got to Number One twice. God is greater than you. My book didn’t only sell and is still selling, it also made me a millionaire! The more you hate, the more I‘m great! 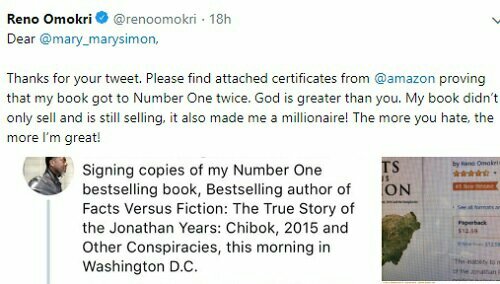 0 Response to "Reno Omokri Replies Critic Of His Book, Tells Her It Made Me A Millionaire"